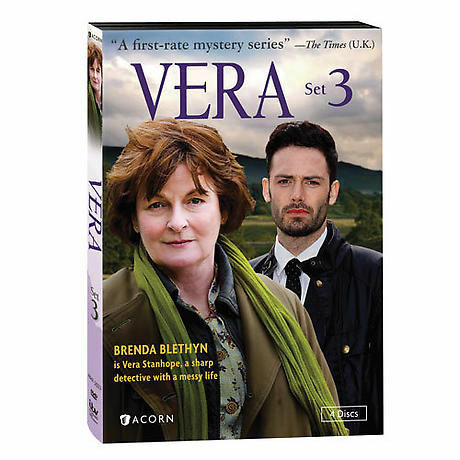 Two-time Oscar(r) nominee Brenda Blethyn (Pride & Prejudice, Secrets & Lies) returns as Detective Chief Inspector Vera Stanhope in this hit mystery series inspired by Ann Cleeves's bestselling novels. Patrolling her "patch" of northeast England, Vera resolutely pursues the truth in cases of murder, kidnapping, and blackmail. While her manner is sometimes caustic, her single-mindedness gets results. Vera is supported by her trusted team, including right-hand man Detective Sergeant Joe Ashworth (David Leon, Rock 'n Rolla). A family man, Ashworth is ever trying to strike a balance between home and work. Meanwhile, forensic pathologist Billy Cartwright (Paul Ritter, The Eagle) and Detective Constable Kenny Lockhart (Jon Morrison, High Times) tend to bring out the scathing side of their boss. Guest stars in these four new feature-length dramas include Saskia Reeves (Luther), Dean Andrews (Life on Mars), and Liam Cunningham (Game of Thrones). 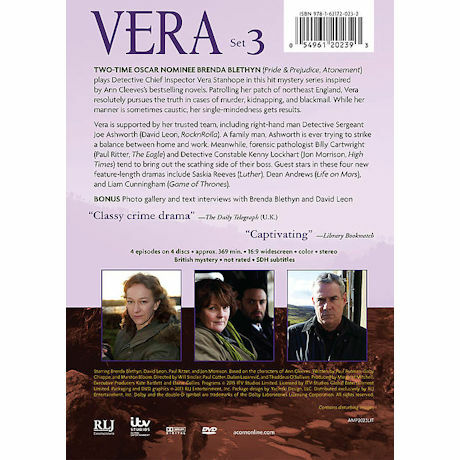 Vera Set 3 includes 4 episodes, 4 DVDs, approx. 369 minutes, SDH.